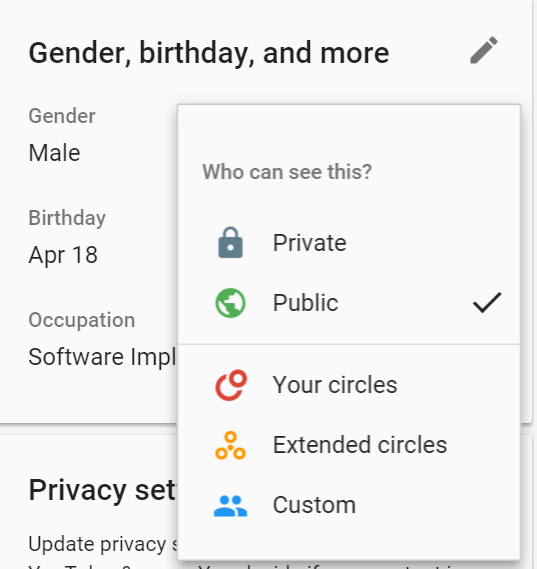 Google has rolled out an easier way to control what personal information is seen across all products, such as G+, Drive, Photos and more. Instead of searching throughout multiple settings pages, all of your information can be quickly and easily found at aboutme.google.com. From here, you can modify your profile picture, contact information, display name, nickname, work history, education, links, contributions, places you've lived, and more. 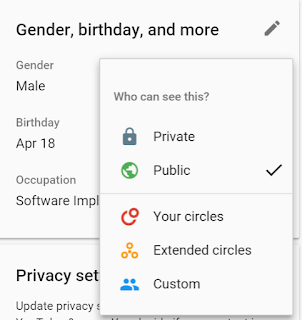 In each section you have to ability to modify who can see this information, whether its Private, Public, or what circles you have setup. By simply clicking on the icon next to the information you will be able to easily modify this setting. In addition, you ave the option to view your overall privacy settings and perform a privacy checkup. Note, currently the view as public option is still in development and will be available soon.